Max Immelmann, “Der Adler von Lille” — one of Germany’s first great aces. On June 18, 1916, Max Immelmann, the famous German ace known as the “Eagle of Lille” (German: “Der Adler von Lille”) met his end in aerial combat. His final flight was over the village of Sallaumines in the Arras Sector, located in northern France. 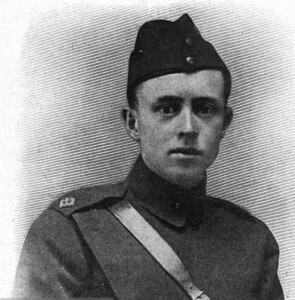 The Royal Flying Corps awarded the victory to Second Lieutenant George R. McCubbin, who received both the the Distinguished Service Order and the Distinguished Service Medal for his work. Today, almost exactly 100 years later, a controversy still remains on what happened. There are three versions of events that are often told. The first is that Immelmann’s guns shot off his own propeller, causing his Fokker Eindecker E.III to shake itself to pieces in midair. The second claim is that Immelmann was shot down by McCubbin’s fire at the very top of his trademark maneuver, the Immelmann Turn, which is today well-known as a half-loop with a half-roll at the top to return the attacking plane upright. A third version persists in some circles, that Immelmann was killed by ground fire, though few still adhere to that theory. All of these explanations are wrong in varying degrees. First, Lt. McCubbin himself never fired a single shot in the fight — though his observer did, so the victory should be credited where credit is due. And second, about that part involving the Immelmann Turn? We’ve got that completely wrong too. 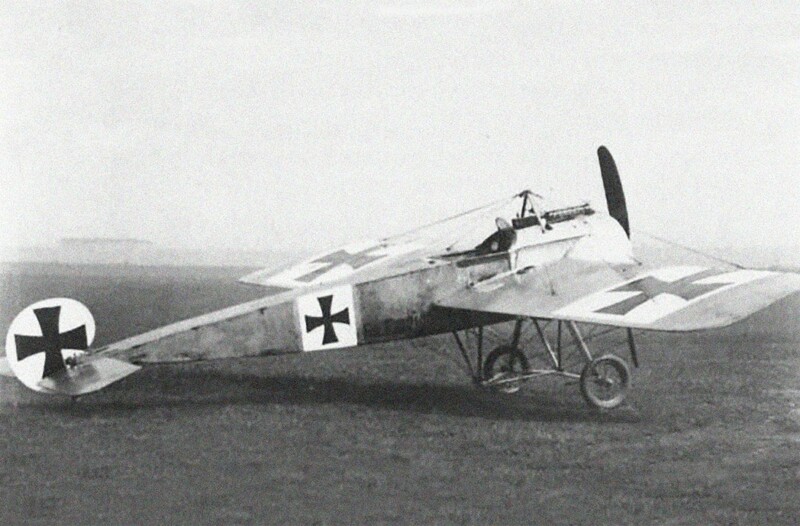 A Fokker Eindecker, similar to the one flown by Max Immelmann on his last flight — note that Immelmann’s plane sported two machine guns. At 9:45 pm, Max Immelmann, flying a Fokker E.III, serial 246/16, lead a flight of four E.IIIs in an attack on three British reconnaissance airplanes of 25 Squadron. The British planes of 25 Squadron were F.E.2b two-seat biplanes. They had a simple mission — to photograph German infantry positions and artillery along the front lines near Arras, and then quickly return to base. The British planes were vastly outclassed by the German Fokker Eindecker E.III types and the odds were extreme — four German fighters against three British recon planes. In fact, the E.IIIs were faster, more powerful, better armed, and more maneuverable than the F.E.2bs. Where the British recon planes could only pull around slowly in a turn, the E.IIIs were quick and could be seen darting in and making high speed firing passes into the enemy formation. One of the No. 25 Sqn RFC FE2b, serial number 6341, “Zanzibar No.1” after captured by the Germans when forced down by Lt. Heinrich Gontermann of Jasta 5 (16 May 1916). As the four German planes descended on the hapless British F.E.2bs, the RFC pilots pulled into a defensive circle, hoping to cover each other — this was what would later be called a Lufbery Circle. A first pass, then a second came as Immelmann opened fire at one of the planes in the formation. True to form, this time his aim was true and his single burst of fire hit the pilot. RFC Lt. J.R.B. Savage, in his F.E.2b pusher, serial number 4909, was mortally wounded and his plane fell out of formation and crashed to the earth. 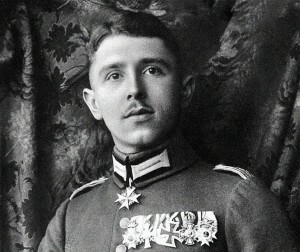 Surprisingly, Immelmann’s wingman, Max Mulzer, was later credited with the victory, though that was eventually overturned. This time, however, Immelmann did not fly past the first F.E.2b and once again pull around in a wide arc at a safe distance. Instead, he pulled up vertically into his trademark maneuver, the “Immelmann Turn”. His goal was to quickly dispatch a second F.E.2b, as the British reconnaissance planes were so inferior and such easy targets for the attacking ace. Whereas many today credit Immelmann with inventing a half-loop maneuver with a roll at the top back upright, in actual fact, the original Immelmann Turn was anything but that. Immelmann’s actual maneuver was a vertical pull-up into an extreme version of a chandelle, but with kicking the rudder hard at the top to pull the nose back around and down, thus allowing the plane to fall nearly vertically back into the enemy formation for a second attack. Immelmann’s favored maneuver, if anything, resembles what we now consider a hammerhead stall. His maneuver would have put him directly behind and above his next target — none other than the F.E.2b of Second Lieutenant George R. McCubbin. At the top of the maneuver, as Immelmann’s plane was at its slowest, the unthinkable happened. On board the second RFC F.E.2b piloted by Second Lieutenant G.R. McCubbin, was in the circle behind Lt. Savage’s now stricken plane, the McCubbin’s gunner, Corporal James H. Waller, who sat in front of the pilot, stood up and pointed his single machine gun backward and up at Immelmann’s airplane. Immelmann’s Eindecker was just reaching the top of its arc and was flying at its slowest point as Immelmann kicked the rudder to begin his descent into the next attack. Corporal Waller fired at the nearly stationary target. His bullets struck home. 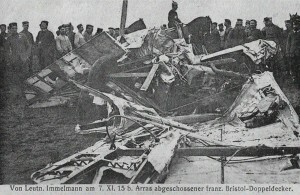 Immelmann’s plane was severely damaged. Corporal Waller would years later claim that his fire had hit Immelmann’s prop and forward fuselage. In any case, with the damage sustained, the E.III fell off the top of the maneuver and began its plunge downward, the engine violently shaking the fuselage. Immelmann, who had experienced two prop failures (he had indeed twice shot off his own propeller in the past) perhaps struggled at the controls — or perhaps he was shot and unconscious. At least twice, Immelmann’s plane apparently leveled before stalling again and pitching downward. Then, the tail broke away. In the wake of Immelmann’s loss, the Germans dispatched investigators to determine how their most brilliant ace of aces could have been shot down. 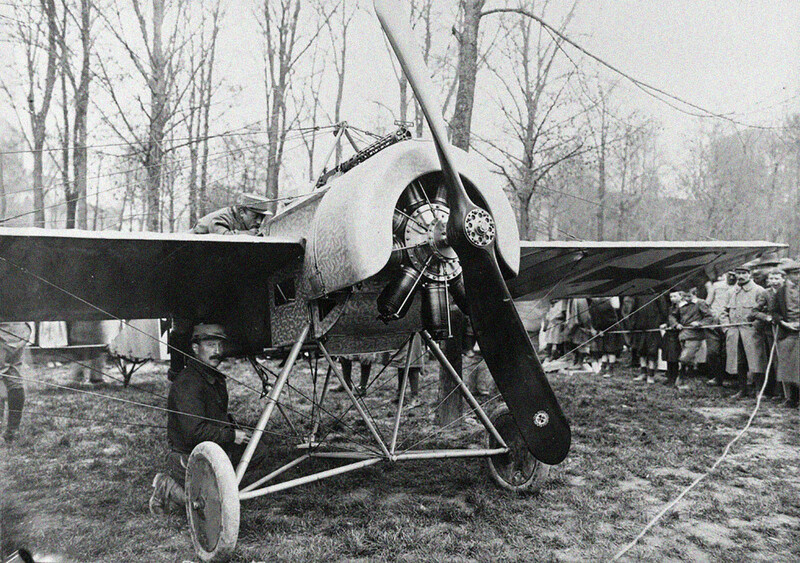 Anthony Fokker himself examined the wreckage. 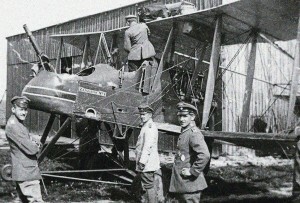 Aided by propaganda, rumors abounded that Immelmann’s aircraft had been shot down by ground fire from the German army itself, rather than as a result of enemy action. Others claimed that by his own firing at the British aircraft, he had shot off his propeller, causing his own plane to crash. Few on the German side were willing to admit that the British had prevailed and shot Immelmann from the skies. 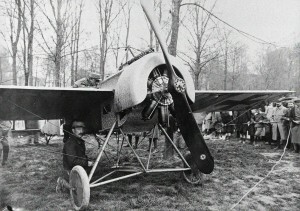 Anthony Fokker declared that Immelmann’s plane had been hit by friendly fire, thus crediting the loss to the expertise of the German Army’s own. What did actually happen is still unclear, though the evidence points clearly that Second Lieutenant G.R. McCubbin’s gunner, Corporal J. H. Waller, did fire off his one shot at Immelmann’s Eindecker E.III and score the victory. Perhaps Corporal Waller’s fire struck the Eindecker’s prop and sheered it away, as Waller later recalled. Perhaps his fire also struck critical parts of the air frame, causing the fuselage to fail and tear away. Perhaps his bullets struck Immelmann, wounding him and knocking him unconscious. There was no evidence that Immelmann’s plane was shot down by ground fire. The combat was a 6,000 feet of altitude — it would only have been heavy anti-aircraft guns that could have reached that high, where the later “experts” declared the damage to be from small arms fire. The wreckage of Immelmann’s Fokker Eindecker E.III. The only evidence supporting a possible malfunction of the E.III’s interrupter gear, which would have meant that Immelmann had shot off his own propeller, was that the prop was indeed found shattered near the hub (whether from impact with the ground, fire from the British airplane, or Immelmann’s own shooting, is unclear. At the point in the combat where he was supposedly shot down, Immelmann was not in a position to fire — it is possible, however, that he had shot off his own propeller, or damaged it, while making his attack just before pulling up. It is worth noting that for Corporal Waller, Immelmann’s Eindecker had posed a perfect target, without any significant deflection and hanging there in a nearly vertical position directly behind. Another question that perhaps could be asked is simply — How could he have missed? Regardless, what is certain is that Immelmann’s stricken plane fell out of the combat in a fatal dive. As the plane exceeded its maximum speed, the rear fuselage broke off. Without the counterbalancing effect of the tail planes, the rest of the E.III plunged vertically into the ground at high speed. If Immelmann was still alive at that point, he was killed on impact anyway. After the impact, German ground forces ran to the downed machine. Quickly, they pulled the crushed body of the pilot from the wreckage. When they saw that the pilot wore the Pour le Merit medal at his neck, they knew he was one of their two greatest aces — it could only be Boelcke or Immelmann, the only two pilots to have received the famous award. On the pilot’s collar they saw the initials “M.I.”, and knew then it was Max Immelmann. The “Eagle of Lille”, was dead. As for Corporal Waller, whose aim had brought down one of the Germany’s top aces, he would watch as the pilot, Second Lt. McCubbin, was awarded with two medals for his flying. Rank Has Its Privileges, as they say For his part, Corporal Waller would receive his sergeant’s stripes as a thank you — well enough deserved for an enlisted man in the Royal Flying Corps, of course. Shortly afterward, correcting the wrong, the RFC awarded him the Distinguished Conduct Medal. A wonderful piece of history! Keep them coming! The “immelman Turn” was my favorite maneuver during acrobatics phase of Navy flight training in SNJ-4′s and 5′s at Whiting Field in Pensacola in 1954. SNJ engines would quit after a few seconds of inverted flying, so it was important to complete the roll at the top pretty quickly. The legend of the last picture is probably not correct. A picture of the wreck of Immelmanns Fokker is on the same page.